Shes crawled through hundreds of tight spaces seeking out molds, sewage, asbestos and water damaged areas, often in a claustrophobic maze of tunnels filled with plumbing pipes, heating and air conditioning conduits, or steaming hot attics that would give anyone a case of the willies. Connie A. Morbach can take all of those things in stride. But she recalls one investigation into an eerie world that still gives her nightmares. It was at a contaminated building, in a small crawl space under the flooring, filled with mold, water damage and plumbing plus a 4-foot diameter spider web, with a huge spider lurking. It was a triple whammy, she said of the contamination she discovered. But the spider was more frightening than the mold contamination. Such are the occasional perils encountered by Morbach, 56, an environmental forensic scientist and indoor air quality expert. And sometimes, Morbach is required to use her expertise in these air-related matters in various courts as an expert witness. Often, her job is not one for the faint of heart, nor is it the most glamorous. Instead of wearing a nice suit and high heels and carrying a leather briefcase, I have a tool box, a moon suit, and probably steel-toed work boots or tennis shoes on, she said. Its not the profession the Clawson resident dreamed of doing while growing up. I didnt envision it even after I was grown up, she said with a smile. Morbach graduated with a degree in biology from James Madison University, took more courses in biology, genetics, biochemistry and toxicology, and later obtained a masters degree in hazardous waste management and chemicals. 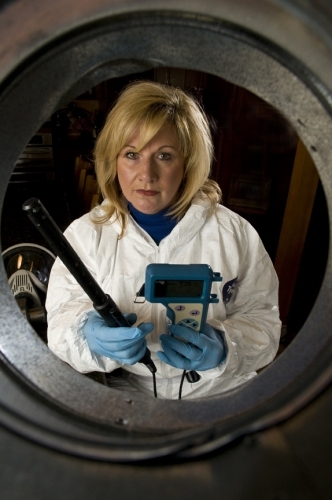 While working for a medical waste consulting firm, her husband, Tom, founded Sanit-Air, which began as an air duct cleaning company. She said her husband found that dirty air ducts were not the sources of most indoor air quality complaints, and she soon began researching procedures for diagnosing those problems. 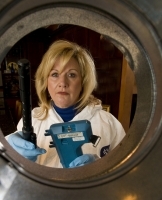 Eventually, Morbach said the company became known for scientific solutions to indoor air quality problems and those requests became so numerous that she quit her real job and helped develop the company into one that diagnosed problems and provided solutions to building-related complaints. It just evolved, she said. And the more we got into it, the more interesting it became. What followed was a number of years of work in the field, and Morbach combining her scientific knowledge and background to become a nationally-recognized expert in the field. Soon, she was being hired by attorneys for diagnosing air quality problems and as an expert witness in civil cases. About then, mold problems were becoming big in the media, and Morbach said we were in the right place at the right time. I did not get into this business to become a legal expert, Morbach said. Im a scientist who actually does the work, and if my findings are needed to support litigation, then I support my findings. Morbach has performed thousands of air tests and environmental evaluations in numerous buildings, such as schools, libraries, courthouses, commercial office buildings, hospitals and homes. She has lectured on the subject, appeared in the print and video media, and written papers and articles about her craft. She said the majority of her business does not involve cases that require litigation, but there are more now than there were a decade ago, and she believes that number will continue to rise because of substandard building practices of the past, the use of some building materials now that harbor mold more readily than wood, and the over-insulating of buildings that result in poor ventilation and air circulation. And the Environmental Protection Agency and medical experts have linked many illnesses, in adults and children, to mold and bacteria, which may ultimately lead to many more lawsuits requiring her expert testimony. While the quest for greening of our buildings continues, Morbach likens some of it to living in a Ziploc bag, and the sick-buildings phenomena. Most people associate green with clean, she said. Green is energy-efficient, and energy efficiency and indoor air quality dont always go together. Morbach has provided legal testimony in a number of cases, both for the plaintiff and defendant, in several Michigan circuit, federal and bankruptcy courts, as well as a few in state courts outside of Michigan. She is currently involved in a case with attorney Dodd Fisher who is representing traffic control tower employees at the Detroit Metropolitan Airport against contractors who allegedly contaminated an area by their prior testing and mold remediation. Morbach is providing expert testimony regarding the companys negligent testing and data interpretation by other mold experts. Morbach has worked on landlord-tenant cases, including one where a leaking toilet above a womans apartment caused the plaintiff to get sick. Repairs were made to stop the leaks, but never to remove the contaminated materials from the leaks, she discovered from her investigation. It eventually resulted in a large settlement. In another case, Morbach found that a roofer accused of contamination in a building had no part in the contamination, which actually occurred many years earlier. In still another case, Morbachs investigation determined that a restaurant owners cooler was not responsible for contamination, but outside leakage. She also aided a family who purchased a house with significant mold damage that was not disclosed, but instead was carpeted and painted over. Her testimony, coupled with that of doctors, engineers and architects, has also helped many people prove their illnesses were caused by molds, shoddy practices, or cover-ups. Historically, its been much easier to prove the property damages, as opposed to the personal injury, she said. And many of those suits begin when homeowners, building owners or renters call her and discover the cause of the problems, and then find an attorney. Kevin T. Kennedy, a Detroit attorney, has used her on both plaintiff and defendant civil cases involving mold. Her work is invaluable, he said. She can explain scientific processes to a jury in laymans terms, and findings are well-respected and based on science. He said she is not a hired gun, or an expert who only testifies for plaintiffs or defendants, but calls each case as she sees it. In cases where Ive prevailed and gotten jury verdicts, Ive believed she was the most important witness. Morbach said she uses the principles of science, her experience, and judgment to reach sound results, and will vigorously defend her opinion in court. I am not an advocate. I am a scientist, she said. I do enjoy this work. I have an investigative mind, and this satisfies that part of me. And it has an overall impact on society that I get to see.